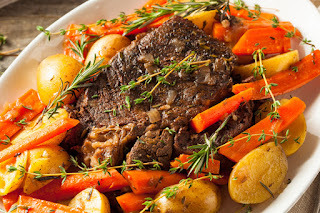 Pot roast was a family favorite when I was growing up, and I think just about every kid's mom made pot roast. It's one of those good, old-fashioned American comfort foods. It requires very little prep time, and just about anyone, regardless of their cooking skill, can whip up a pot roast. 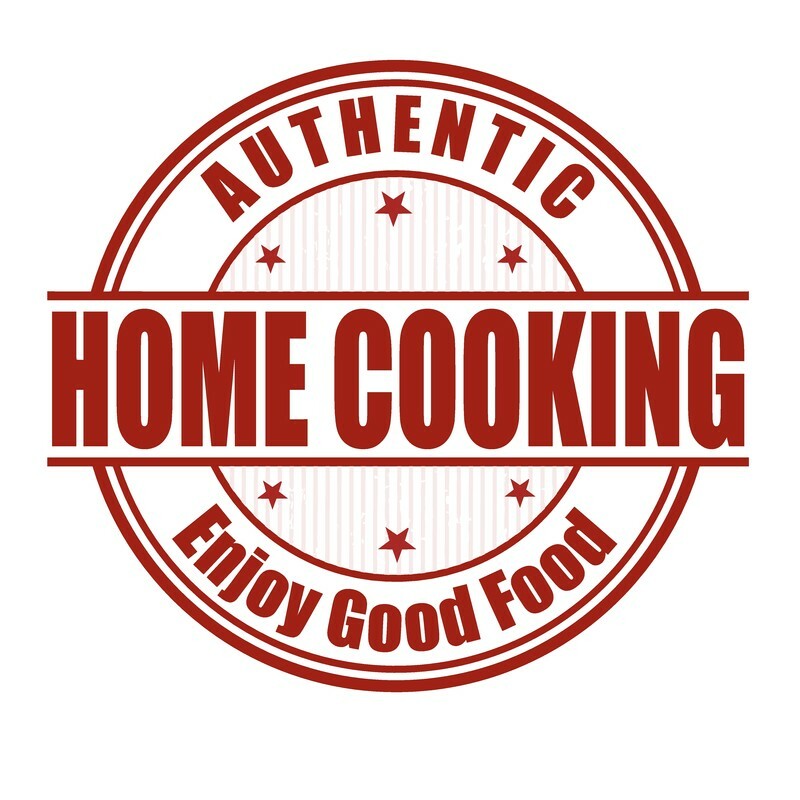 Modern cooks have a few more options, such as using a crock pot instead of a roasting pan, and there are a few other variations you can use as well. My mother never wrote down her pot roast recipe. Some dishes are so basic they really don't require one. This is how I make a pot roast. No doubt it's similar to the way the rest of you make your pot roast too. I start by putting my roast in the roasting pan, and then adding chopped onions, carrots, and potatoes. (Red potatoes work very well). Then, depending on your preferences, you can add celery, shallots, corn, squash, or lima beans, whatever vegetable you like. One time I even tried adding broccoli. It tasted okay, but broccoli doesn't always smell so nice when it's cooking, and it left a strong odor in my kitchen. Season the mixture with season salt and pepper. 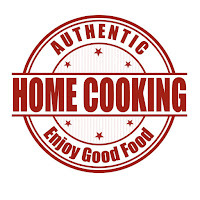 You can also use celery salt, garlic powder, onion powder and parsley, whatever your favorite seasonings happen to be. I prefer having my pot roast well done, so if I'm baking it in the oven I set the thermostat to 350F and roast it for about 15 minutes per pound. However, I usually make my pot roast in the crock pot, so I'll start it in the morning and cook it on low all day. Whichever method you choose, be sure to add about a half cup of water or beef broth to your mixture before you begin roasting. That way the roast will stay moist and not get too dry. Here's another tip: the leftover roast can be used to make tacos. Place it in an iron skillet, add a little water and some taco seasoning blend, and break up the meat with a spoon as it's heating. Another delicious recipe from the pages of Rosie's Riveting Recipes. During Rosie's day beef was in very short supply, so any recipe that helped make scarce beef go further was helpful and appreciated. This recipe is similar to a meatloaf and it's still delicious today. Divide hamburger into six equal servings. Roll or pat out as thin as possible. Sprinkle with salt and pepper. Make dressing by combining bread, milk, ketchup with 1 tablespoon melted margarine. Place a spoonful on each square. Bring edges of meat up over the dressing, pat into shape, being sure all dressing is covered. Fry in hot margarine in skillet. When brown on both sides, add 1/2 cup water, cover and cook over low heat 8 to 10 minutes. Serve on raw onion slices. *Butter may be used in place of margarine. Modern adaptation. Caramelize the onion slices in a separate pan. Serve on a hamburger bun or an onion roll. I don't know who said not to judge a book by it's cover, but as a book publisher, I must respectfully disagree. A successful book needs a compelling cover. 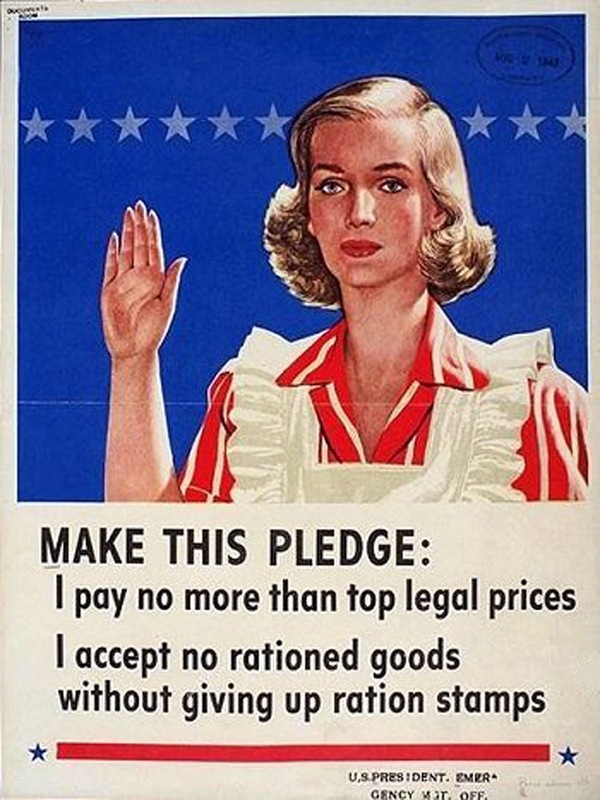 During World War II, the U.S. government produced hundreds of posters to help keep up morale at home. 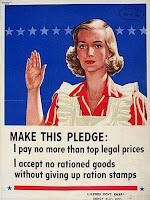 They depicted everything from rationing to scrap drives to civil defense. All are in the public domain, and I included a number of them in Rosie's Riveting Recipes. 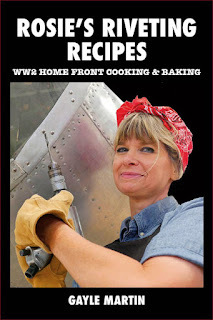 I also chose this one for the cover of my original WW2 ration cookbook, Anna's Kitchen, as it illustrated food rationing perfectly. 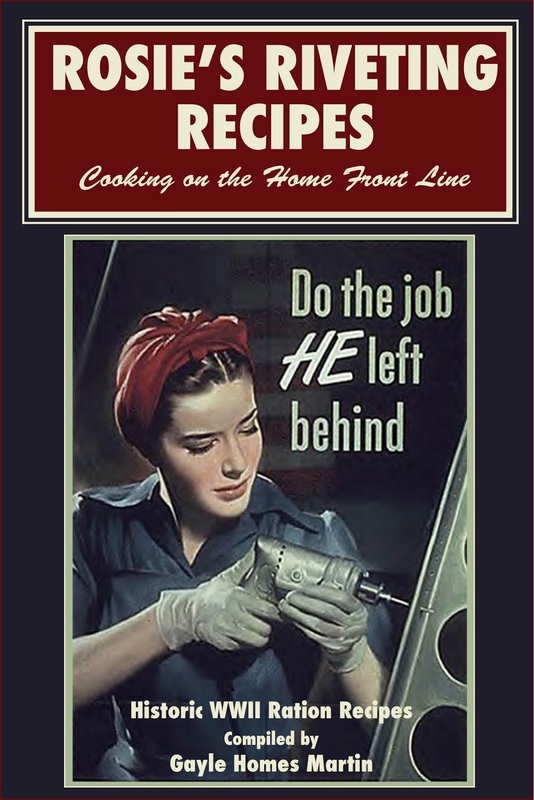 As must as I love this poster, I wanted Rosie's Riveting Recipes to have a different look. Now we've all seen the famous, "We Can Do It," poster. It's a wonderful piece of art, but it's been used so much that it's become a cliche. I choose a different poster, and the following was the original cover art. It wasn't bad, but it wasn't quite right. Thankfully, I live in Tuscon, Arizona, home of the Pima Air and Space Museum. My good friend, Rob Resetar, needed to shoot some photos to include in the Rosie's Recipes book trailer he was working on. Another friend, Sheryl Ann McKinley, had played Rosie in the video, so the three of us met at the museum and Rob shot photos of Sheryl Ann in front of a few WW2 era airplanes. He also needed a copy of the book cover, so I emailed the above cover to him after the photo shoot. Rob didn't think the cover was right either. His response was, "Let's use one my photos for the cover." The result is what you see today. A unique image that illustrates the story perfectly. Thank goodness for caring friends, and kudos to Rob and Sheryl Ann. It takes a team to produce a book, and I'm grateful to both for their help. My mother gave me this recipe many years ago. It was one she acquired after my father retired and they joined an Airstream Club. Potluck dinners were a common practice at their rallies, and this recipe soon became a family favorite as well. Over the years I too have taken it to many a potluck. It's always gone over well, and sometimes I'll fix it at home just because I like it. It's quick, easy to prepare and delicious. Generously coat a 9 x 13 inch baking dish with cooking spray. Fill bottom of the pan with broken tortilla chips -- about 1/4 inch thick. Add chopped chicken breasts, green chilies, corn and black beans. Blend soups together with chicken broth in a medium sized mixing bowl and pour over top. (If a thinner sauce is desired add more liquid.) Cover top layer with cheese and add bread crumbs, if desired. Bake at 350F for 35 to 45 minutes or until sauce is bubbling and cheese is melted and slightly browned. Variations: For those who like it hot -- use jalapeno or chipotle peppers instead of green chili peppers.